Metal roofing was once a fairly out-of-reach option for most homeowners due to cost. In the past, a metal roof was two to three times more expensive than an asphalt shingle roof. However, shingle prices and materials have changed a lot over the last few years, so metal roofing is a more viable option for those looking to replace or build new commercial and residential roofs. While the initial installation is still more expensive than shingles, the material is more durable and very easy to maintain, making it a long-term win for homeowners. Give us a call to discuss metal roofing for your Knoxville, TN or Chattanooga, TN home or business! The recent appeal of metal roofs has made this material a key contender for many who are considering replacing an outdated or damaged roof, as well as those who are designing new construction. This type of roof can provide an aesthetic statement to the overall composition of a home exterior, but it also provides tremendous longevity and resistance to the elements. Metal roofs can be installed directly over existing shingles, which eliminates the cost and effort of a roof tear-off prior to application. Metal also reflects the sun’s UV rays, which can be damaging and increase temperatures when absorbed by asphalt shingles. (Think about walking on hot pavement on a really sunny day.) This can help lower utility bills and keep the home cooler during warm seasons. And when the colder months are near, metal sheds snow, ice, and water like few materials can, so you’re keeping your roof clear of heavy build-up. Energy efficient – Most are Energy Star rated! Let us take a look at your existing roof and provide a metal roofing consultation at no cost to you! We offer financing for residential customers as low as $80 per month. Call us for more details. 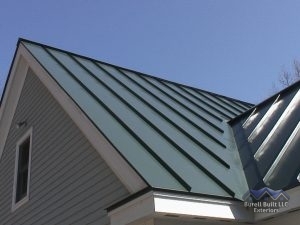 Homeowners and commercial developers can choose from twenty different color options for their metal roof installation. Manufacturers also offer a full line of color-matched trim and flashing to create a uniform, clean look that is also secure for the years ahead. 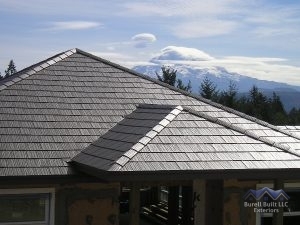 Burell Built Exteriors offers metal roofing from many of the area’s top suppliers. Our customers can choose from Master-Rib and Advantage-Loc roofing panels, which come in 29 or 26 gauge material. Both come in a great variety of colors, and we can help recommend the best choice for your home and local climate. The 26 gauge panels are thicker and heavier, which makes them more impact-resistant, so we’ll consider the variables and come up with an exterior solution that best fits your unique needs. We look forward to helping you design your new metal roofing for your Chattanooga or Knoxville area home or commercial property! Give us a call at (865) 385-6926 in Knoxville, or (423) 702-4042 in Chattanooga, TN. Updated on September 16, 2016 at 2:55 pm by Burell Built Exteriors.